Here at the BWC there are sure to be at least a handful of us tempted by the idea of self-publishing. In fact, there are at least a handful of us who have self-published already. So, if you’re thinking about going it alone to get your book out there, read on to see what our self-publishing members have to say about it. I wrote an article for The Bulletin (the now, sadly, defunct magazine of the expat community in Brussels) about language learning. As I did so, I realised that over my years of teaching languages to adults in London and Brussels I had learned a fair amount of useful things about resources, learning styles, what works and what doesn’t. There weren’t, at the time, really any books out there with tips on learning a language, and in any case, since I am opinionated, I wanted to put my version out there. I was querying my first novel at the time, and not having a lot of luck with agents. I honestly didn’t have the energy to do it for non-fiction as well, and I wasn’t optimistic about its chances of publication – not least because it’s short, though I suppose I could have “padded” it – but I knew people would find it a helpful resource. It also fed nicely into my language teaching business – I could offer discounts if people bought the book, for example, and was another way of getting my name and the name of my business out there, and of creating a “platform” for myself as someone knowledgeable about languages and language learning. I also wanted to experiment a little with self-publication. I was hearing a lot about it at the time – it was still a new concept, and the marketplace was far less flooded than it is now. I enjoy the marketing side, and it’s fun watching numbers in real time on the Amazon marketplace. Conquering Babel: A Practical Guide to Learning a Language does what it says on the tin! It includes sections on staying motivated, finding a language tutor, how to improve in the four key areas of writing, reading, speaking and listening, and the pros and cons of different ways of learning (one-to-one, group classes, self study, etc.). It’s available as a Kindle book on all the Amazons (co.uk is here and .com is here) and also as a physical book. What are the pros of self-publishing, in your experience? The number one thing, and the thing that in the end might convince me to do it for my fiction too, is that you get your book into the hands of people who might find it helpful, instead of it just languishing in a drawer. I haven’t made much money from it – nor did I expect to – but it still adds up to a bit of extra pocket money. If and when I go back to language teaching, it will also be a good resource for my students and potential students. Even back in 2011, when I self-published, the process was a relatively simple one. I can only imagine it’s got more user-friendly since then. What are the downsides of self-publishing, in your experience? In my experience so far, there aren’t really any, with non-fiction like this. I’m under no illusions as to the likelihood of the booklet being published and available in a bookstore. The disadvantage for fiction, and the reason I’m holding out for traditional publishing – so far – is that I really would like my book in bookstores, and I would like the kudos that comes from being traditionally published. Many readers don’t care, or even know, if a book is self-published, but in the literary community it is still looked down on. I do believe that publishers have a vital role to play in gatekeeping and, in theory at least, marketing. These days, too, it is harder to get an audience as more and more books are published and some of the useful tools that Amazon deployed in the early days are not available anymore or have been weakened. You have to be prepared to spend a lot of time marketing yourself – which for me is enjoyable, but still detracts from the main thing, which is the writing! I actually never really considered anything else than self-publishing Golden Fields. From what I can gather it is very much the way new writers get started these days. The beauty is that you decide when you want your book published. Golden Fields is a story of adventure, love and war in the lives of a few unusual people living in South Africa at the time of the Boer war until the First World War. During this time, many important historical events influence their lives. It also tells a beautiful love story between two elderly women, Theodora Villiers and Lily Wood, as well as about their relationship to Theodora’s grandson Antonius. It was published by the American firm Balboa and can among others be ordered via amazon. The most positive aspect is that you decide where and when, so to speak. Well, the first downside is that it costs money. Although the production costs are fairly reasonable, a lot of things you will need to do for the people producing the book, like proofreading, deciding on layout issues (such as what text you want to have on the dust cover), giving directions as to how the cover design should look, and so on. Also, if you want a press release that will cost extra. However, prices do vary. I was happy with Balboa in many ways, but it was a bit cumbersome to work with people in a very different time zone. Actually I did not choose. My agent (a long term friend who usually promotes artists and painters) decided to widen her field so I am her first writer. She has followed my work for 30 years at least. She found me the printer and the literary critic who did my introduction. However, I found the artist who did my illustrations. We are both members of the SABAM. So all a bit serendipitous, really. I have always found people like my writing but did not realise it could have a wider appeal so we set up a blog last September and it soon became clear that it had widespread interest. I had 3000 hits the first month. That made my agent decide to go ahead. My main reason for going ahead with it is not so much to make money as to be able to share my work, as I have been told it is uplifting and poignant and gets to the ‘nitty gritty’. Check out my blog and see for yourself. 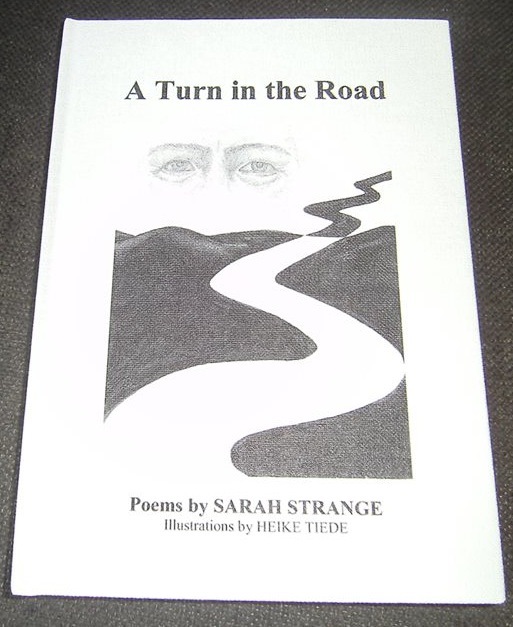 My book, A Turn in the Road, is a series of bereavement poems spanning 9 years. My husband, also a poet, died in 2005 and I wrote how I felt as the months went by. Bereavement is not a popular subject but it is a universal one and since I found a new partner last year the ‘journey’ now has a happier (and more palatable) ending. Lots of charity organisations are interested and I have been reading out my poems to Relay for Life (cancer org.) since 2011. You can choose your own style, cover, number of copies (electronic publishing makes small print runs much more practical these days). You are your OWN publisher – any profits go to YOU. You have to find your own distribution outlets but with the internet this is becoming much easier. It is harder to get known when you cannot benefit from wide networks. I had a contract with a Belgian Publisher for the Dutch version of my children’s book but I thought it would be exciting to do the English version myself using a local illustrator from the Isle of Skye. I’d recently set up my own company together with my husband and we wanted this to be one of our projects. It’s about a sheep who feels different from the others because she never knew her mother and was brought up on a Bed and Breakfast, so she goes off to look for a place where she really belongs. I have since written three more stories in the series. The books are like fables and are for both primary school children and adults, and are often bought as gifts. You can find out more about these books on www.asheepcalledskye.com. I sell the books to shops in Scotland and also do various storytelling events to promote it. I have also done projects in schools both here in Brussels and in Scotland. I also sell it through the website and Skye the sheep has her own Facebook page and blog. You have complete control over the selling, marketing, design, publication and price of your book. It is all your investment and your profit (or loss!). This enhances your motivation. You can change strategy, price and marketing techniques if they are not working and try something different. You can offer discounts and do special promotions. You are completely involved and know exactly how your book is doing. If it’s a success it can be more profitable than working with a traditional publisher. It is very hard work and requires great motivation and commitment because there is nobody else who is going to do anything for you. It’s all completely up to you. There are fewer and fewer independent bookshops and the big chains often do not want to take your books because it’s too much administration for them. They also take a considerable discount. You have to be prepared to sell your own book, which is not always what a writer likes to do. You have to find different ways to get your book out there but you cannot afford to offer the same sort of discounts that Amazon does. It is no use trying to compete with the big companies so you need to find your own particular niche and target the places where your book will sell. This is a big challenge but you learn a lot in the process. My first novel, Final Descent (Outskirts Press, 2013), is a contemporary story set inside the airline industry. It’s a tale of corporate greed and the toll that the chase for the almighty dollar takes on an idealistic corporate soldier and his family. It’s really a modern day allegory of good vs evil inside the nuanced world of corporate America. My second novel, Jell-O and Jackie O (Outskirts Press, 2014), is a coming of age story set amidst the glamour and calamity of 1960’s America. It’s the tale of a little boy who finds escape in the chic world of Jackie Onassis and the jet set. While the little boy dreams of Capri and Mykonos, that era’s clash between traditional and progressive values plays out between his mom and her ‘liberated’ sister in the boy’s family home. Time and control are the things I find most valuable about self-publishing. I’m a writer; I want to write. I don’t want to waste time jumping through hoops to satisfy the whims of agents who seem to take sadistic joy in their complicated submission processes. One literary agency actually said on its website: “If you think we’re making you jump through hoops and testing you, we are. If you can’t follow instructions, we don’t want to work with you.” Another agency website explained their threat of throwing out imperfect submissions with this: “Do we risk pitching the next great American novel into the trash bin? Sure! But there’ll be another on our desks before long.” I have no patience for those types of attitudes. With self-publishing, you retain complete control of your work. With my publisher, I set my own pricing. I determine when my book will go to market. In addition to pricing, cover designs are based on my concept. I offer my books in hard and soft cover as well as Amazon’s Kindle version. That’s my choice. I plan to self publish a third novel in the fall of 2015. Of course, lack of established distribution channels is the biggest downside. Large publishing houses like Random House, Harper Collins and Viking get their books into stores where many people still shop before heading to the internet to do their purchasing. The bigger houses also have promotional budgets that push works. While my book may sell well among my friends and their friends and so on, someone sitting in Omaha, Wichita or even London isn’t going to know T.D. Arkenberg. But no one ever said that being an author would make you rich. Self-publishing allows me to do what I love most, write. While self-publishing was an overwhelmingly positive experience and I am pleased with the quality of the published work, I can’t say the same for the marketing add-ons. I found every one of the add-ons offered by my publisher of little value. They are primarily gimmicks, in my opinion. One caveat to the above: if Scribner, Penguin or Viking came knocking, I certainly would run to answer the door.